Bordering a bed can be done in SO many ways; trenches, fabricated edging, bricks, rocks, grasses, wood, concrete, and bottles. The material you choose can evoke the style of your garden. Fabricated edging, bricks, or poured concrete edgings have a more formal appearance. Rocks, grasses, and trenches have a natural appearance. Bottles, rip-rap, and some wood edgings have a cottage garden flavor. If your garden has a definitive style, match your border material to that style. Borders serve two purposes – to define a space, and to make maintenance easier. Borders corral bed mix and mulch and prevent or slow turf grass intrusion into your beds. This is not a cut and dried option. If you are going to remove turf mechanically, or are going to prepare your soil using a tiller, do not install your border until those operations are complete. You can install the border before you fill a raised bed with purchased bed mix, or you can fill and shape the bed and then install your border. I have prepared beds by installing a border and then filling the interior with sheet materials, leaves or mulch to kill the turf, and I have piled up leaves, raked them out into a shape I like, and then installed the border at the edge of the covered area. Trenching – Trenching is probably the least expensive way to border a bed, but it can be a little labor intensive. The edge is cut with a half-moon edger and a “moat” of soil is created between the line of turf and the surface of the bed. The edge of the trench is usually kept neat with a string trimmer when the lawn is mown. Any creeping stolons of grass can be easily observed if they cross the “moat” and can be snipped or pulled. 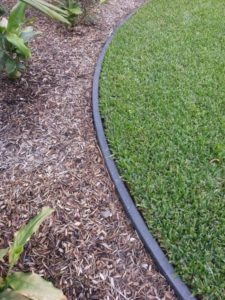 Fabricated Edging – Homeowners have limited choices of fabricated edging for DIY installation. Plastic edging is available at home improvement stores, but it is the least attractive of the lot and I don’t consider it installation-friendly. 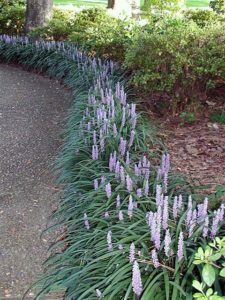 It requires that a trench be dug along the edge of the bed and that the sometimes less than cooperative edging be installed and back-filled. It does last a long time, and the rolled edge is tough enough to take repeated string trimmer use, but it is relatively unattractive. The joining couplings are also substandard in my opinion. They aren’t long enough to make a secure joint. Lightweight metal edging is also available. It can be installed in a trench, but it does not have to be as deep as for plastic edging. It can be shaped along curvilinear beds, and sharp turns can be made with careful bending. This edging comes with stakes that hold the edging in place and link joints together. These edgings last for years, but have a few limitations. They are not friendly to foot traffic, especially for pets. 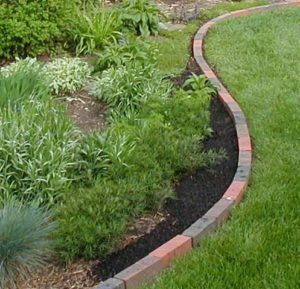 I have used this edging in my own landscape, but I run a line of brick along it to prevent foot injury to my dogs. 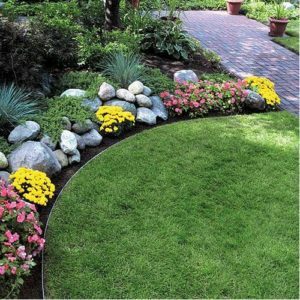 Professional landscapers have more options from their wholesale landscape suppliers including heavier weight metal edging, several widths of edging, and a new composite material that has a woody appearance. 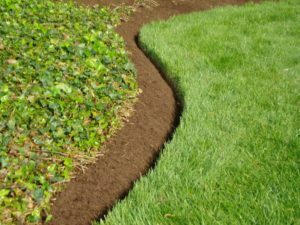 It may be advisable to hire a professional to install your edging since it is a pretty permanent part of your landscape. These edgings do a good job of preventing grass intrusion into the beds and they curb mulch very well. Fabricated edging is usually intended to sort of disappear from view, but it can take an intentional modern, industrial feel when it is installed where it shows as a feature. Bricks – Brick edging can take on different moods depending on the type of brick used and the manner in which it is installed. A single row of old, recycled brick placed end to end has a very casual feel. But brick can be installed in very formal ways as well. A brick border can take time to install and can be expensive if the material is purchased new, but it lasts virtually forever. Rocks – many kinds of rocks can be used as borders. Natural rock, flagstone, quarried and shaped rock, even man-made rock. 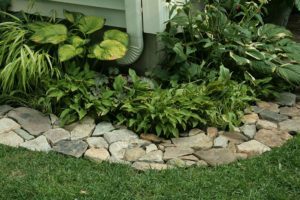 It takes a bit of finesse to install a rock border that will effectively hold back soil and mulch on the bed side and keep out grass intrusion on the turf side. Rock borders can be dry stacked or mortared. A poorly installed rock border never looks good. If your DIY skills are not up to par, this is a place you should hire a professional even if you install and maintain your own garden. Bottles – The first place I saw a bottle border was Fredericksburg, Texas. There are wonderful old houses in Fredericksburg, some of which have been restored and turned into museums. When they were excavating the gardens, they found that some of them had been bordered in old wine bottles. Wine bottles were reused until they were damaged and could no longer be corked. The green glass was beautiful, so they were laid end to end as a garden border. Interesting in recycling has brought this practice back into our gardens. 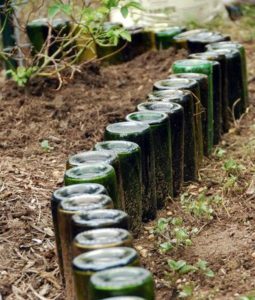 Bottles are usually installed side by side, neck down, buried in the soil. Wine bottles are tough enough to tolerate a string trimmer, but be prepared to replace the occasional casualty. Grasses – Mondo Grass and Lirope borders are pretty synonymous with Gulf Coast gardens. Both are easy to install, last for years, and have little maintenance other than an occasional thinning. They are surprisingly good at preventing turf intrusion.